Double Glazed Units can be processed in different types of glass such as Planitherm, Low E, Active (self cleaning), Solar control. The double glazed Units can be made up in all sorts of sizes to include arched units. The units can also be made up with leaded design if required and can come with clear, obscure or toughened glass. Also with a choice of spacer bars in between the panes of glass. Spacer bars sizes came in the following range:- 6mm, 8mm, 10mm, 12mm, 14mm, 16mm, 18mm and 20mm Therefore a standard unit size with a 20mm spacer would read 4/20/4 this would be a 28mm unit. Spacer bars come in the following colour options White, black, brown, gold, silver or Warm Edge Spacer Bar. These can be made in the same specs as above but with 3 panes of glass with a spacer bar between each. We have the equipment needed at our South Shropshire Glass premised to cut the following glass types. 2mm is usually used for picture frames. 3mm is used for old windows that do not have a rebate to hold 4mm glass. 4mm is used for standard single glaze replacement glass and to make up double glazed units. 6mm can be used for shelving or table top glass. Mirrors come in 3mm or 4mm thickness and can be cut to size, with plain, arised or polished edge. 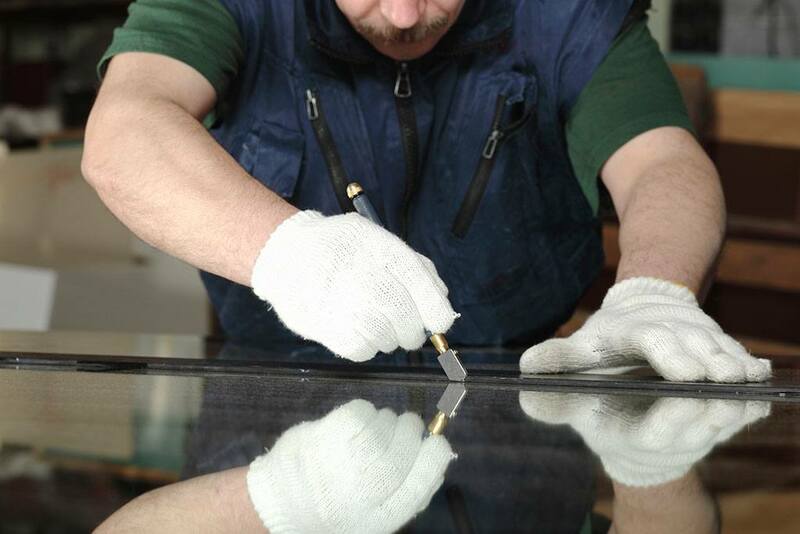 We can process toughened glass off-site and offer a range of stamps such as the standard toughened safety stamp, furniture stamp or a text stamp depending on your requirements. 6.4 laminated glass is a safety glass which holds together when broken as it consists of 2 pieces of glass held together with a bonded layer. Georgian wire Cast (also refered to as Pyroshield Safety Texture) is a 7mm wired obscure glass which offers a 30 min integrity. Georgian wire Polished (also referred to as Pyroshield Safety Clear) is a 6mm clear glass and is more expensive than the obscure glass which offers a 30 min integrity in appropriate timber and steel frames. Pyrodur is for use in fire doors and partitioning. It is a clear, laminated fire and impact-resistant glass offering up to 60 minutes integrity. Robax is a fire glass for wood burning stoves. Beveled edges or holes can be processed off site.